The event was such a hit that we knew we needed to offer our clients the opportunity to give back on a more regular basis. 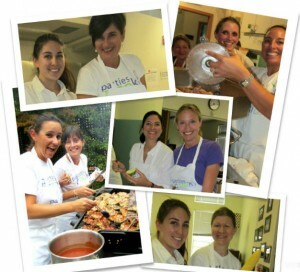 Brainstorming ensued, and Cooking with Kindness was born. Last Friday, our crew of selfless volunteers (all PTC staff) arrived at the Hamilton Family Center in San Francisco. 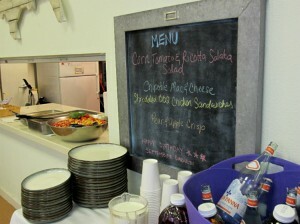 Together, they prepared and served a delicious, healthy meal for families at the center. It was great to see how appreciative the families were (and how much those kids can eat!). Warm and fuzzy feelings spread quickly. Thanks to this successful trial run, the event timeline was nailed down and logistical kinks were smoothed out. One such mishap involved smoke, fire alarms, a few firemen and a whole lot of detective work. I’m sure some of our volunteers appreciated the break intervention. BIG thanks to our lovely team of volunteers, the friendly firemen, and the incredibly helpful Hamilton Family Center staff! We are very excited to offer a flawless, feel-good option for corporate team building events just in time for the holiday season! This holiday season has been filled with cocktail parties, cookie exchanges, and gingerbread house mansion village competitions. Why not spice up your next holiday feast or Christmas party with something special? It may be news to some people, but filet mignon (or filet de bœuf, as the French would say) is not just for the likes of Missy Elliot. Actually, the impressive dish is quite simple to create, and we’ve got the recipe below! Per usual, this tried-and-true seasonal recipe has been put to the test countless times at our corporate holiday parties and team building events over the years. Enjoy, and Happy Holidays! This holiday recipe can also be found in our Main Dishes library! Make Breadcrumb Crust: In a medium bowl, mix the breadcrumbs with the Parmesan, anchovy, garlic, thyme and parsley. Mix in olive oil and season the breadcrumb mixture with the salt and pepper. Sear and Roast Filets: Slice the tenderloin into 8-10 round filets. Rub the filets all over with olive oil and season with salt and the cracked peppercorns. In a large sauté pan, sear the filets on both sides, 1-2 minutes per side. Reserve the sauté pan. Transfer the filets onto a sheet pan, allowing space between them. Brush the tops of each filet lightly with Dijon mustard. Cover the top of each filet with 2 Tablespoons of the breadcrumb mixture. Roast in the upper third of the oven for 6 minutes (for rare) or until the internal temperature of the meat reaches the desired doneness (125°F rare, 140°F medium, 155°F well done). Make Sauce: While the filets are resting, add the wine to the reserved sauté pan and bring to a simmer over moderately high heat, scraping up any browned bits from the bottom. Strain the wine into a medium saucepan and simmer over high heat until reduced by half. Just before serving, whisk in the reduced beef stock and then the butter, a few pieces at a time. Add vinegar and pepper. Serve: Drizzle sauce on the plate and then top with filet (if you put it on top it makes the crust soggy).